Ecos > 2013 > A French MP dares! 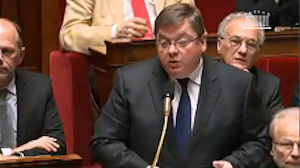 A member of the French conservative party UPM, François Vannson, condemns "laisser faire" windfarm policies and demands that sustainable development principles be respected as part of the energy transition. In a written question to the Minister for the Environment, the MP for the Vosges region François Vannson, condemns the inconsistencies within the French government’s wind policy by highlighting discrepancies with sustainable development objectives. He puts forward a set of specific proposals, including that wind farms be built at no less than 1,500 m from habitations, and that they be banned from forests and protected zones. He also calls for the re-establishment of the “5 mast” rule, the appointment of consultants by an independent authority, and that impact studies consider social cohesion as a factor. In conclusion, Mr. François Vannson points out that the energy transition cannot be properly managed without the consent of populations based on respect, dialogue and the preservation of natural environments. These proposals also form part of a call for the controlled development of wind energy, launched by a group of several environmental protection organisations. After the difficulties involved in passing the Brottes bill in Parliament, this stance from a member of the opposition attests to the growing discontent surrounding the French government’s energy policy. A response from Minister Delphine Batho is expected. Here is the full text of the written question to the Minister, as deposited at the French Parliament (Assemblée Nationale) on February 19, 2013. Mr François Vannson calls the attention of the Minister of Ecology, Sustainable Development and Energy to the dangers of a laisser-faire development policy for wind energy. Indeed, this renewable energy is only sustainable as long as its development is controlled and monitored by regulations. Industrialists from the wind sector must not be the only ones able to “call the shots”. all within a development dynamic that sticks to principles of responsible production and consumption. In order to comply with these objectives, it is more important than ever to consider elements such as flourishing landscapes, biodiversity and social cohesion – the very elements that the obsession with wind is threatening. In the same logic, it would be timely to reestablish the 5 mast minimum rule, to go back to defining wind development areas on a local scale as was planned for ZDEs, to revise regional wind plans established without consultation, to include social cohesion in the scope of impact studies, to allow for the appointment of consultants by an authority independent of the project backers, to ensure wind farms are not built in protected zones, to ban the establishment of wind farms in forests and forest edges, and to maintain a minimum precautionary distance of 1,500 m from homes. The energy transition cannot be properly managed without the consent of populations. It must be based on respect, dialogue, and the preservation of natural environments.